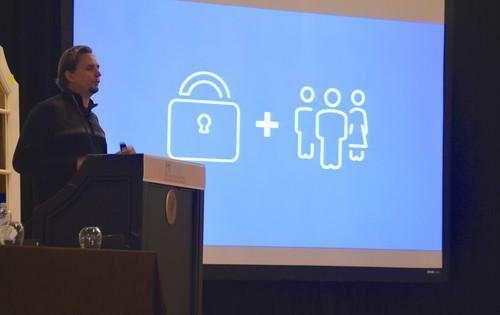 Facebook chief security officer Joe Sullivan, pictured Feb. 18, 2015, at the M3AAWG conference in San Francisco. In an indication that the ride-hailing app company is aware that it had better get security right, Uber Technologies has hired away Facebook's head of security, Joe Sullivan, to be its first CSO. Sullivan has been fairly high profile as Facebook's CSO for the last five years, and besides time spent at PayPal and eBay, he has a background prosecuting cyber crime, re/code reports. Sullivan has his work cut out for him, with Uber facing challenges ranging from data privacy to its riders' physical security. Chip maker Broadcom wants to increase the number of devices that can accept mobile payments with a new NFC microcontroller for PCs and connected devices. Integrating the chipset into PCs would let users hold their smartphone or smartwatch against a laptop instead of entering card details to make a payment. And for companies like Samsung Electronics and Apple, it's a way to tie together their smartphones, smartwatches, laptops and payment systems into one ecosystem. The European Commission is checking out Apple's streaming music plans, asking record labels to reveal information about agreements with the company. Apple acquired streaming music service Beats Music in May last year and is said to be developing a revamped version. The Commission is concerned that Apple will use its size and influence to convince labels to abandon other streaming services such as Spotify. Google has tried it with Inbox, Microsoft handed Outlook Web App users Delve and now, with Verse, IBM is giving webmail a fresh look as it teaches its venerable Domino mail server new tricks. IBM goals include eliminating clutter, understanding the user, and blurring the line between messaging and social networking in the enterprise. The Web version of Verse is now available, with an iPhone app to follow later this month, an iPad app late next month, and an Android app in late June. Are hacker sanctions a case of government overreach? New U.S. government sanctions targeting the bank accounts of suspected cyberattackers are raising questions: what's the recourse for people who say they are wrongly accused, and how accurately can the government identify the source of attacks? Legal and cybersecurity experts said it's unclear what the government's standard of proof will be, and critics point out that the White House offered few details about how organizations can defend themselves against accusations. Samsung Electronics will make the A9 processors for the next iPhone model, dislodging TSMC as a supplier of the chips, reported Bloomberg. The South Korean conglomerate lost out to TSMC on the earlier A8 processors for the iPhone 6 and iPhone 6 Plus devices, likely on account of its rivalry with Apple, but the two smartphone rivals have moved toward a truce, agreeing to drop many of their patent lawsuits. As goes Chrome, now follows Firefox: The Mozilla Foundation said its products will reject new digital certificates issued by the China Internet Network Information Center (CNNIC), which means that sites using the certificates will not be trusted by Firefox browsers. The move follows a similar decision by Google for its Chrome browser, and is in reaction to CNNIC violating generally accepted Internet security practice and issuing an intermediary certificate to an Egyptian company, which turned around and issued unauthorized certificates for Google domains. Snapchat received 375 data requests from authorities in the U.S. in just four months, according to its inaugural transparency report put out Thursday. Governments have a tight window in which they have to act, though -- Snapchat says it deletes people's messages from its servers after all recipients have viewed them, or 30 days after an unopened message is sent. Android gets a rap as being a less safe mobile environment than iPhone, but Google claims that fewer than one percent of Android devices had a potentially harmful application installed in 2014. This includes devices whose owners have enabled the "unknown sources" option in order to install applications from outside of Google Play. For those users who only downloaded apps published on Google Play, the percentage of affected devices was much lower, at 0.15, Google said. In this week's World Tech Update, Microsoft goes after laptop diehards with the new Surface 3 tablet, Amazon wants you to restock household items with a push of its Dash Button and NASA's flying saucer lander takes a spin.